On December 9, 2016 Australian writer Georgia Blain died from a brain tumor. Her life contained more than its share of tragedies and disappointments. In her award winning writings she examined the mundane and often over looked moments of everyday life with brilliant style, keen insight and tenderness. 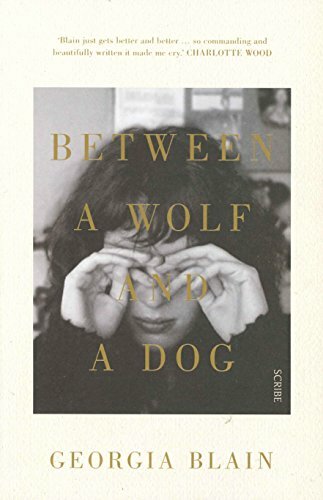 Between a Wolf and a Dog, Blain’s eighth and final novel, takes its title from a French phrase for twilight, (L’heure entre chien et loup), the hazy and often murky hour between day and night which makes seeing and interpreting objects very difficult. In heartbreaking irony, the novel begins with a scene in which Hilary, the mother of Esther and April, reveals that she has cancer and that the tumor has spread to her brain. Esther is a family therapist with an appointment book that catalogues the anxieties of the middle class: loneliness, relationships, death. She spends her days helping others find happiness, but her own family relationships are tense and frayed. Estranged from both her sister, April, and her ex-husband, Lawrence, Esther wants to fall in love again. Meanwhile, April is struggling through her own directionless life; Lawrence’s reckless past decisions are catching up with him; and Esther and April’s mother; Hilary, is about to make a choice that will profoundly affect them all. The scenes of the book take place over one seemly ordinary rainy day in Sydney, and poignantly reveal the voices of the troubled and heartbroken, that seem to echo Esther’s own concerns, fears, and hopefulness. Rendered with haunting and powerful prose this is a stylish, clever and moving novel from a writer at the height of her writing abilities. The experience of reading Between a Wolf and a Dog, though, is larger and more profound than its pages. What is significant about this novel is the way it seamlessly balances unhappiness and sorrow, and its inevitable sense of heartbreak with optimism. Blain writes of Hilary’s struggles with her diagnosis and mortality: “. . . loosening herself, trying to unpick the grip of life from her limbs, aware of how quickly time has been pushing her forward, shoving her now, relentless and sure, into this tiny space, the last moments, where she needs more strength than she has ever needed before,” any expectation of serious indifference ceases to exist. Whittled down to its most elementary points, Between a Wolf and a Dog is basically a novel about love and understanding. It is essentially an homage to the glory of being alive and its message will resonate long after its final pages have been read. It is a painfully truthful depiction of family and the complexities of interpersonal relationships. But it is also a celebration of what’s good in all of us—our ability to live in the face of everyday worries and disappointments, and to draw power and positivity from its transformative control. “Like all of her works,” Blain writes, of Hilary’s final film, “it demands trust from the audience, that this seemingly random scatter of images will find a narrative order.” In this way, a work of art is similar to a life. This brilliant and thought provoking novel has thus become an incredibly powerful statement and significant story, which Blain has graciously gifted to all of us. On a whole, Blain’s entire body of writings are emotionally driven with an honesty that requires the reader to be courageous in the face of pain. They make us profoundly aware of how we experience our own life and how we ought to live. The characters of her novels are often distressed, indecisive, but never faultless. They are, like all of us, inconsistent and flawed. Her narratives never give us the false hope of living happily ever after, but instead, overflow with the understanding that life does not always deliver security and comfort. What Georgia Blain’s works give us is the simple knowledge that life—whether long or short, complex or simple—most certainly always goes on.